Now the predefined fish of Minecraft, really exist. 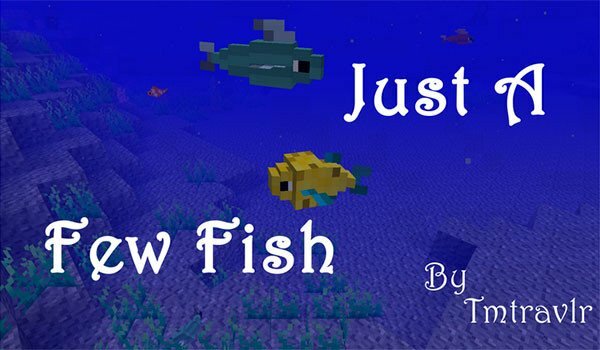 Just a Few Fish 1.7.10 is a mod that aims to improve various aspects of fishing and fish. As you know, today in Minecraft there are four types of fish, however not on the rivers or seas, just one can catch and that’s it, that is not really there. This mod makes the fish have entity, that is, have modeling, animation and have ultimately exist. We find the predefined Minecraft fish swimming around the seas and rivers. These fish can be caught and have animation. But not only that, we can also create water tanks or to put fish tanks. Can be raise thises how any other animal, for that, we take seeds and throw them into the water tank or aquarium. How to install Just a Few Fish Mod for Minecraft 1.7.10? Now the fish will swim through the water and can keep them in aquariums!